Yield: 1 loaf (1 1/2 lbs.) About 12 slices. Nonfat milk and lemon juice was substituted for the buttermilk and no salt butter was used when preparing this recipe. Preheat oven to 375 degrees. Lightly grease a large baking sheet or place parchment paper on a baking sheet. In a large bowl, mix together flour, sugar, baking soda, baking powder, salt and 1/2 cup butter. Stir in 1 cup of buttermilk and egg. 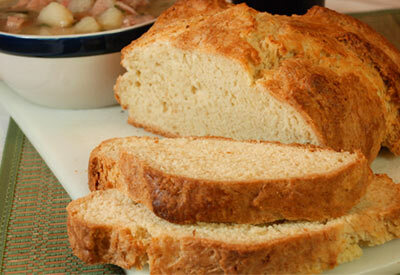 In a small bowl, combine 1/4 cup melted butter with 1/4 cup buttermilk; brush loaf with the mixture. Use a sharp knife to cut an "X" into the top of the loaf. Bake in preheated oven for 45 to 50 minutes or until a toothpick inserted into the center of the loaf comes out clean. After 30 minutes of baking, brush loaf with the butter and milk mixture and again at 40 minutes. *No buttermilk? Substitute 1 1/4 tablespoons lemon juice and enough milk to make 1 1/4 cups.